The only indicator of a doll's happiness, therefore, is what goes on in their secret lives whilst us humans are off getting involved in the rigours of our own lives. Luckily, television has always taken a keen interest in dolls, so we've been able to garner plenty of insights into their curious mindsets. And whilst dolls can experience some absolutely stratospheric highs, they can also find themselves being passed through a mangle of psychological nightmares that proffer all manner of questions on self-worth and existentialism. Don't believe me? Just take a look at Tottie. 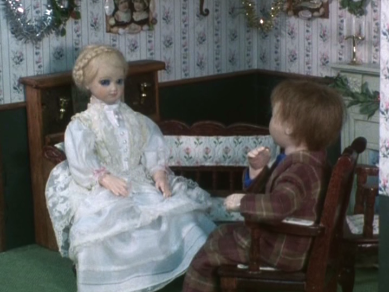 Tottie (Anna Calder-Marshall) is a small, wooden Dutch doll dating from the first half of the 19th Century who originally cost but a farthing. Fast forwarding a hundred years or so, Tottie is owned by two young girls - Emily and Charlotte Dane. Zipping back in time again, Tottie had been previously owned by Emily and Charlotte's Great Grandmother and Great Aunt who housed Tottie in a fine doll's house, but that was all a very long time ago. Nowadays, when she's not being played with by Emily and Charlotte, she's kept in a shoe box with her fellow dolls. These dolls are an unusual and assorted mix of characters, but they're truthful and make fine friends for Tottie. Mr Plantaganet is a boy doll made from china with brown glass eyes and real hair, his original guise had been that of a Highland soldier before the bagpipes were ripped from his hands and a moustache drawn on him by his careless, cruel owners. After falling into a state of disrepair which included having his foot chewed off by a puppy, Mr Plantagnet was rescued by Emily and Charlotte who repaired him as best they could. Mrs Plantaganet (Una Stubbs) is better known as Birdy and is a doll made from celluloid who is light and full of life. The name, Birdy, comes from her scatterbrained nature and flights of fancy she indulges in as she dances and sings her way through life with unabandoned joy. Apple (Olwen Griffiths), meanwhile, is a small, plush doll with an unapologetically childlike approach to life who has a real passion for tumbling down stairs whenever he has the chance. Whilst Apple is positioned as the Plantaganet's little boy, Darner the dog doll is the family pet made from clipped wool with a darning needle for a backbone. Tottie and her companions lead a simple, if cold, life in their shoebox but are just grateful that Emily and Charlotte are right-minded children who look after them. Regaled with stories about the fantastic doll's house Tottie used to live in, though, the dolls soon begin to wish that they could live in such a wonderful place rather than the drafty old shoebox. 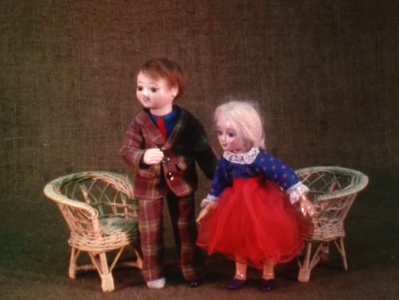 And, of course, wish is all that the dolls can do for, as the narrator (Oliver Postgate) explains, "Dolls are not like people. People choose, but dolls can only be chosen". 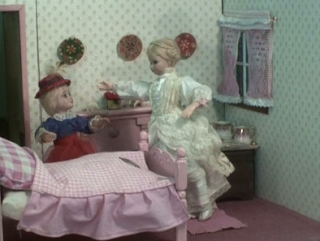 Doll's wishes, however, can come true and, eventually, one of Emily and Charlotte's great Aunts gets in touch to tell them that she has found an old doll's house that they're free to have. It's the same house that, a hundred years previously, Tottie had lived in and the doll's are thrilled when it arrives. However, much to Tottie's horror, also arriving is Marchpane. A beautiful, china doll with real blonde hair and blue glass eyes, Marchpane is a wicked and cruel doll who despises children and believes herself superior to Tottie and Co in every way. Attempting to adjust to life with Marchpane is made even more difficult as Marchpane - due to her superior weight - is able to wish harder and stronger than the other dolls. 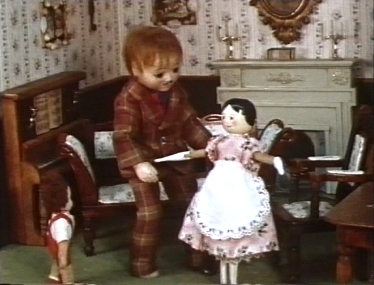 Covertly influencing Emily and Charlotte through the first set of adventures known as Tottie: The Story of a Doll's House, Marchpane gradually takes control of the doll's house and enslaves the rest of the dolls as her servants. Apart from Apple, who Marchpane allows to come and play in the sitting room, but only so she can take him away from his family and let him play dangerously which ultimately leads to a tragic conclusion. 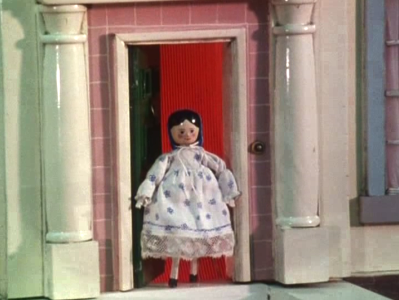 With Marchpane being shipped off to a museum where she's kept under a glass dome (out of the reach of awful children), good times return to the doll's house in Tottie: The Doll's Wish. Marchpane, however, is soon back in the house and, after slapping Apple to the floor, proclaims that the house is hers again. This time, however, she has met her match in the form of Melinda Shakespeare, a china doll who is visiting the house from the USA to write a piece on Tottie for a doll's magazine. Based on the novels written by Rumer Godden, the two series of Tottie were produced by legendary production company Smallfilms (The Clangers, Bagpuss et al) for Goldcrest Films. The Story of a Doll's House first aired over the course of one week in 1984 with episodes going out in the 4.25pm slot on BBC1 - repeats followed in 1985, 1988 and 1991. 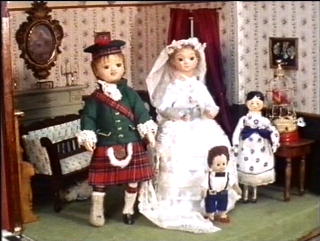 The Doll's Wish, meanwhile, arrived on BBC1 as part of the Children's BBC schedule in 1986 where it aired on Wednesday afternoons at 3.55pm with just one repeat of the series coming in 1987. As the series was not produced by the BBC, they chose not to keep copies of the series and, unfortunately, the master tapes of The Doll's Wish have gone missing. 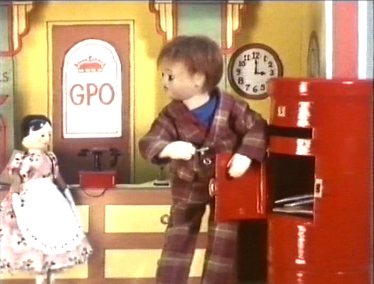 Thankfully, off air recordings of all the episodes have been tracked down and this has allowed The Dragons' Friendly Society to release The Doll's Wish (along with The Story of a Doll's House) on DVD. 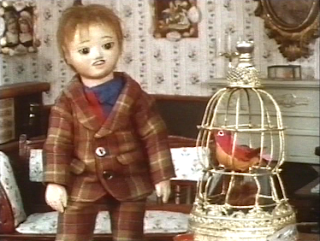 The only other merchandise relating to the TV series was a tie-in book (okay, it contained a photo of the doll's house and Tottie) of Rumer Godden's original version of The Story of a Doll's House. I was certainly old enough to have watched both series of Tottie during their various airings, but the memories I had were very vague. I had strong memories of Pinny's House (also produced by Smallfilms) but there was little I could remember about Tottie - however, whenever I was recollecting about Pinny's House I would often refer to it, quite mistakenly, as being called Tottie. So, I had clearly watched Tottie at some point, but it needed a much further and in-depth investigation aka watching it in bed with a cup of tea and a KitKat handy. Oh and there was the macabre allure of one of the dolls murdering one of the other dolls. Well, at least, that's what the legend stated. And, you know, when it's touted as being the first ever murder in a children's TV show it kind of piques your attention. 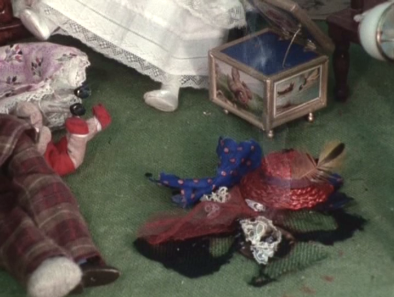 But hang on, a doll murders another doll in a children's TV show? Surely not, I mean, what would Mary Whitehouse have said about that? No matter how unlikely it sounded, though, there was obviously something dark lurking in there, but we'll get back to that later. So, getting back to the basics, let's take a look at the characters. Tottie, herself, is the series' guiding light and regularly lays down plot strands to help the narrative unfold with measured helpings of kindness and wisdom (a quality missing from her fellow dolls who are all a little unbalanced and foolish). Mr Plantaganet is a complex soul with his slightly nervous disposition, but when you look at his backstory of abuse it's not a surprise as he appears to be suffering PTSD and this regularly surfaces as anxiety. Birdie, meanwhile, may be gay and effervescent (voiced wonderfully by Una Stubbs) but at times she appears to be suffering some severe bouts of mania. Apple, of course, is as grounded as a child can be, but his rambunctiousness is cleverly built up to execute one of the most devastating strands of Tottie. Whilst Mr Plantaganet and Birdie are in need of a doll psychiatrist due to their mental imbalance, Marchpane is completely off the scale. Clearly, with her self-obsession and delusions, she's a bona fide narcissist, but its such an intense narcissism that when it combines with her disdain for anyone outside her breathing space, you can see the makings of a true psychopath. Marchpane is a calculating character and her cruel, wicked traits act as an important warning that beauty and privilege are by no means any indicator of truth or goodness. Tottie has a reputation for being dark, but Marchpane is only the tip of the iceberg. 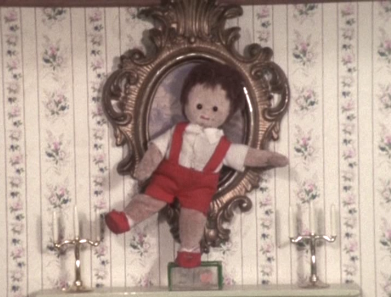 In fact, perhaps the most terrifying aspect of Tottie is that the dolls, although appearing to their human owners to be inanimate, are fully conscious beings with hopes and fears, but eternally damned with a crushing sense of helplessness. Unable to convey their needs to the human world, they're continually reminded that they have no choice over their destiny; they're the silent voice, a position that almost every small child watching can identify with. There are also strong lessons on the power of persuasion, both the positive effects and the dark, dark powers of Marchpane's wishes. The ease with which Marchpane is able overrule the other doll's wishes with her own - simply due to her superior size - again throws a spanner in the works of any glimmer of hope for the dolls. Essentially at the mercy of her whims, it's a demoralising set of circumstances and helps to contribute to the suffocating sense of dread which infects every square inch of The Story of a Doll's House. And, of course, matters come to a head with the murder of Birdie. Except... it's not really a murder. Sure, it's quite likely that Marchpane wished for Charlotte to light the lamp in the sitting room. And, yes, Marchpane knew that the impulsive (and flammable) Apple wouldn't be able to resist its allure, but does she actually murder anyone? No, not really, Birdie bursts into the room during a particularly manic episode and, being even more flammable than Apple, goes up in a burst of blue flames. You couldn't charge Marchpane with murder though. There's some sense of premeditation about it, but I doubt any court in the land could convict her of telekinetic premeditation. 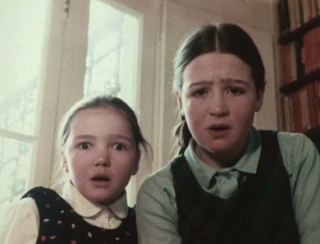 Still, The Story of a Doll's House doesn't need an actual cold blooded murder to underline its sinister credentials. From the silent suffering that Mr Plantaganet has to endure from his original owners as they strip him of all dignity (a move later repeated by Marchpane) through to Tottie's terror at being carted off to a dolls exhibition, it's a somewhat downbeat series with only the occasional shard of hope puncturing the oppressive atmosphere. And that hauntingly melodic music box theme tune by David Heneker really helps to create a foundation of fragile beauty and hope. More upbeat is The Doll's Wish, but without that discernible air of terror hanging in the air it suffers slightly. Many of the plot strands feel trivial such as Mr Plantaganet dealing with a delivery of Valentine's cards and Charlotte's friend Tilly pines rather lacklustrely for a wax doll who featured (rather forgettably) in the first series. Only the transatlantic arrival of Melinda Shakespeare adds any feeling of excitement to the proceedings. Marchpane, of course, is back, but it's a diminished return which feels repetitive and her brand of misery and terror is much more muted this time round. Crucially, The Doll's Wish provides a happy ending with Marchpane being banished (once more) as she suffers a fall from grace and is plagued by crippling delusions. There's also, the rather sudden romance which blossoms between Mr Plantaganet and Melinda which leads to a most bizarre wedding ceremony for the pair which is even attended by a whole host of human characters from the series. It's an unusual end to a highly unusual series, but finally it appears as though the dolls have manage to attain some sense of control over their lives. Oliver Postgate limits Tottie to a single sentence in his memoirs. I saw a memorable paper about this series at a Children's Television conference at Warwick in 2015. The presenter - Michael Lawrence - tried quite a dangerous strategy. He started with a lot of personal disclosure about how he used to watch it when he was 11 despite it being a little girls' programme, how he didn't identify with boys things, and was beaten up for being effeminate, etc. After a couple of minutes of this I did start to think, "This guy is working through a lot of issues here". But by the end when he'd talked about finally getting to watch the programme again after 25 years, and realising what important memories he'd repressed, all of the stuff at the start turned out to have been really relevant. I never watched Tottie. In fact, when it was on the Radio Times had a font that made bold "i" and "l" look identical, so for years I thought it was called Tottle. So I wasn't the only child to find this mildly terrifying? Thanks for the article, interesting reading.